Some hedgehog owners have found that food additives or supplements may also help improve skin quality. We suggest using food additives or supplements only under veterinary supervision. The following information is a summary of products used by other hedgehog enthusiasts but we cannot personally recommend any of the following products from our own experience. Flax Seed Oil is reported to help dry skin, aid in digestion, and is beneficial for overall good health. It can be purchased at any health food store. 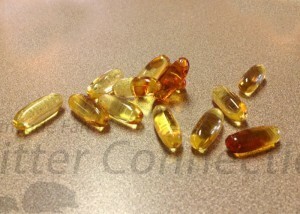 Many breeders buy flax seed oil caplets from their local drugstore. These convenient capsules can be punctured on one to allow a small amount of oil to come out. If your hedgehog’s food does not already contain flax seed oil, you can also add a few drops to your hedgehog’s food. The kibble will readily absorb the flax seed oil. This can be repeated daily. Too much flax seed oil can cause diarrhea. I think what really helps his skin is adding the flax oil to his food. I feed Hejji two teaspoons of chicken or turkey baby food with flax oil each night. I mix 2 capsules of flaxseed oil in the little jar, then freeze the baby food + flax oil mixture in a mini ice cube tray, once frozen I store the cubes of food in plastic bag in freezer = super easy. I think some people pour flaxseed oil over the dry food, but Hejji won’t touch it like that. This product contains Omega 3, 6, and 9 fatty acids. It is found in the refrigerated section of some health food stores. Only one small drop per day is necessary while the problem persists then only a couple times a week on a maintenance level. One drop added to the food two or three times a week is a typical recommended dose. It will most likely take about one month to show improvement. The fish oil is also good for the heart. Fish oil does contain high levels of Vitamin A and D (both of which are fat-soluble) which means the level taken must be highly monitored as toxic effects can occur with overdoses of A and D.
Fish oil may cause the hedgehog’s stool to have a stronger odor. It must be kept refrigerated and tightly sealed or it will go rancid.